Check your e-mail for news of upcoming anniversary deals! THANK YOU to everyone who voted for us, and THANK YOU to everyone who has joined us on our journey so far! 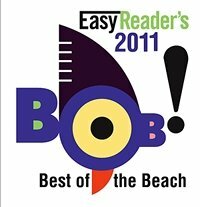 We truly appreciate your support and patronage! May is a frantic month in northern hemisphere gardens. Spring is winding down and summer's just around the corner. Warm climates change rapidly to hot climates. The end of April and the month of May is just about the best time of the year for our local gardens. Everything is bursting with bloom, color and health. Take the time to sit and enjoy the work you have put in over the past few months, preparing for this time of year. In my garden all my climbing roses are exploding in color and fragrance, my clematis have saucer sized blooms and my hydrangeas are just showing their first hints of color. I cannot resist sharing this corner of my garden... just look at the beautiful blue clematis "Mr. President"! Bulbs. Don’t cut off the still-green foliage on spring blooming bulbs that have finished blooming. Leave the tops on to help provide sustenance for the bulbs for next year. Don't remove them until they have finished their job and turned brown. If your bulbs have multiplied substantially, they may profit from digging, separating, and being held over in a cool, dry place to be replanted next fall. Deadhead. Remove fading flower blossoms before the plant goes to seed. 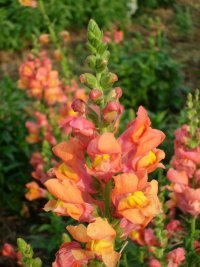 This will keep your garden neater and prolong flowering. Deadhead and begin replacing pansies and primroses as the blossoms fade. Fertilize. Your lawn, roses, citrus trees, fuchsias, avocado trees, vegetables, and flowers all need regular fertilizer during the growing season. Fertilize and deadhead your repeat blooming roses after the flowers fade to encourage a second round in early summer. When applying granular fertilizer, avoid getting it on the foliage to prevent fertilizer burn. Fertilize your warm season lawn grass in June. If using a granular fertilizer, add flour to the spreader. This will help you see where you’ve been so that you won’t over fertilize. For the least impact on the environment, choose an organic fertilizer blend. Fruit and Vegetables. Clean up fallen fruit from citrus and other fruit trees and keep harvesting vegetables when they are young and tender. If you have the space, try subtropical fruit such as bananas and cherimoyas. Tie tomato plants to strong tomato cages or wooden towers with gentle, stretchy vinyl tape. Go shopping. 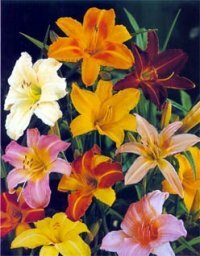 Treat yourself to at least one great new plant before the best selection is gone. Houseplants. Re-pot houseplants in new soil and move into a slightly bigger pot if they are root bound. Move them outdoors for their summer vacation when/if nighttime temperatures stay consistently above 60 degrees F.
Iron deficiency. A sign of iron chlorosis is yellow or pale leaves with green ribs. If you see this, apply chelated minerals according to package directions. Landscape. Start digging that pond you’ve been talking about. Clean bird feeders. Turn the compost pile. Rip out invasive plants before they spread even further. Clean up any drooping or ragged fronds on palm trees. Treat yourself to a water feature or garden fountain. 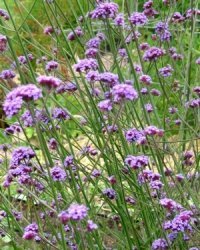 It will attract birds and other wildlife to your garden. Mow. Keep mowing the lawn regularly. It's the best thing you can do to control weeds and keep grass thick and healthy. Mulch. Apply a 2-3 inch layer of mulch on flower beds and around the base of trees, shrubs and plants taking care not to cover any stems or tree trunks. This helps to reduce weed seeds from germinating, conserves moisture, and helps prevents disease, while giving the garden a finished appearance. Perennials. Shop for summer and fall bloomers like asters, coreopsis, daylilies, gaillardia, gaura, gloriosa daisy, heliotrope, penstemon, pentas, purple coneflower and salvias. 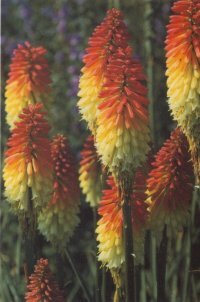 Make sure tall perennials are staked. Pests. As the weather heats up, so do pest problems. To help identify what’s bugging your plants and find a solution, bring a sample of the affected plant into Deep Roots and ask one of our nursery associates to identify the problem and suggest a cure. 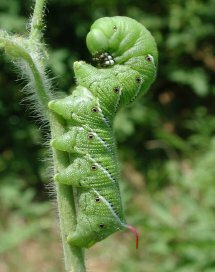 Examine your tomato foliage regularly for tomato hornworm. Keep watch for aphids, cabbage caterpillars, cutworms, scale, slugs & snails and any signs of fungal diseases (leaf spot, mildew, rust etc.). Hand pick or wash off any pests you can see. Spray with a suitable insecticide if the problem persists. Plant. Sow seeds or plant seedlings for tomatoes, corn, green beans, melons, peppers, squash, cucumbers, eggplant, lima beans, and summer and winter squash.Continue to plant warm-season flowers such as marigolds, cosmos, sunflower, nicotiana, verbena, zinnias and petunias. 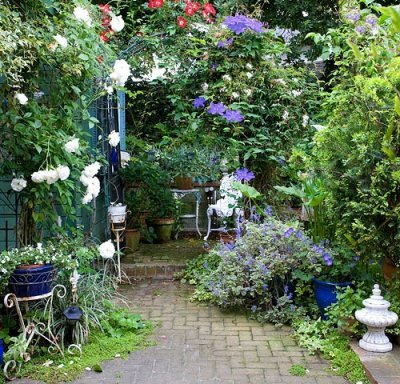 Plant vines such as jasmine, mandevilla and clematis for spectacular colorful flowers. Plant or transplant trees and shrubs before the heat of summer. Pots. Before planting in new clay pots, pre-soak them in a bucket of water for 5 or 10 minutes. If you plant in terra-cotta when it is dry, it wicks moisture from the soil. Wash old, used clay pots in a weak 10% bleach solution before re-using them. Pruning. Prune winter- and spring-flowering trees and shrubs once they stop blooming in order to stimulate new growth that will bear flowers next year. 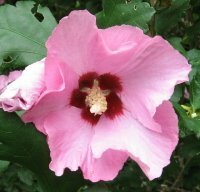 If hibiscus, princess flower, and other subtropicals have become leggy and awkward, cut back by as much as half to reshape. Water. Keep up with watering. Even highly drought-tolerant plants can need irrigation in hot weather. Water large cacti, for example, once a month and agave and yuccas every three weeks. Stop watering. When foliage on garlic, bulb onions, and shallots begins to dry out on its own, that’s your cue to stop watering. The lack of water prompts bulbs to form the dry outer layers that allow them to be stored. Weeds. Regularly weed flower beds and vegetable plots. Don't let the weeds or crab grass go to seed or you will have a never ending weed problem. May 14 - Your Garden's Most Wanted: Beneficial insects. The goodies that eat the baddies. How to identify them, and how to encourage them to inhabit your garden. May 28 - Irrigation. How to retro-fit your system to a drip. Demonstration at 10 a.m. The question most often asked recently has been, "How can I get rid of the raccoons that have been tearing up my lawn?" Answer? Get rid of the grubs living under the grass that they are trying to feed on. The grubs are the larvae of the June Beetle more commonley known as the June Bug, which is a pest both in its larval and its adult form. There are many types of June Beetle and they are found all over the American continent. 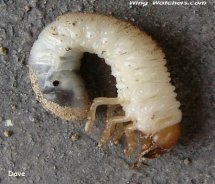 June Beetle larva live in the soil and feed on the roots of turf and lawns. They are the cause of patchy brown spots and areas of die-back in lawns. Larva also feed on the roots of weeds, flowers and vegetables. To add insult to injury, raccoons, skunks and opossums love to eat these grubs and will rip up your lawn to get at them. In spring the larva emerge from the soil as adult beetles. 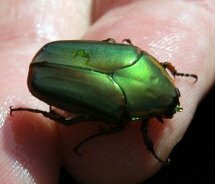 The adult June Beetle is common to our area is about one inch long and has an iridescent green or copper body. If you have had lots of June Bug larvae living in your soil you will have lots of these large beetles flying at night looking for mates. The female beetles lay their eggs in the soil. A new generation of larvae hatch in about a month and they feed through the summer. As soil conditions get drier and when winter arrives the larva dig deeper into the soil. As temperatures rise in the spring they move closer to the surface where they pupate and emerge as adults, starting the cycle all over again. To get rid of them and save your lawn we suggest Beneficial Nematodes. Control Fleas, Grubs, Beetles, Termites and Other Subterranean Pests with Beneficial Nematodes! Beneficial Nematodes are live microscopic organisms (non-segmented round worms) that occur naturally in soil throughout the world. They are parasitic to insect pests that typically have a developing (larval or pupal) stage of life in the soil; however, they have been known to also parasitize above ground stages of adults, nymphs and larvae. After application, the nematodes immediately get to work. Upon finding a pest, they can enter it through various body openings or directly through the body wall. Once inside, it is not the nematode that actually kills the pest, but the toxic bacteria inside the nematodes gut that is the real weapon – symbiotic bacteria, that when released inside and insect, kill it within 24 - 48 hours by causing blood poisoning. Beneficial Nematodes release the bacteria in order to create food and a hospitable environment for their own reproduction. As the food resources within the dead pest become scarce, the nematodes exit and immediately begin searching for a new host. As long as there is a suitable host, the will continue to survive and parasitize. HOW ARE BENEFICIAL NEMATODES APPLIED? Since nematodes are alive and sensitive to light, apply them early in the morning or at dusk. If necessary, they can be stored in a refrigerator for up to 2 weeks. It's easy to apply nematodes. Before applying, make sure the soil is moist. Simply mix nematodes with water and apply using a watering can, hose end sprayer, backpack or pump sprayer or through irrigation or misting systems. Lightly water again after application. WHEN AND HOW OFTEN SHOULD NEMATODES BE APPLIED? Use beneficial nematodes whenever larvae or grubs are present, during the spring, summer and fall months. As pest larvae feed on plant roots beneath the soil surface, severe damage can be done before you realize you have a pest dilemma. If adult insects are present, their eggs, nymphs, larvae and pupae will soon be developing. For Treatment: Apply beneficial nematodes every 2 weeks until pest infestation subsides. For Prevention: Apply at least 2-3 times per year in the spring, summer and fall. Nematodes are considered to be one of the most lethal parasites known to kill plant pests. Depending upon the pest(s) you are treating and the method of application, it can take from 2-30 days for you to see results. It is important to remember that nematodes disintegrate pests from the inside out. You will not see dead insect bodies as you would with a chemical knockdown. Instead you will notice fewer and fewer of the pest(s) over time. Like all insects and organisms, some nematodes will survive the winter in a dormant state; however, we recommend re-applying on an annual basis to ensure that your pests do not get out of control again. 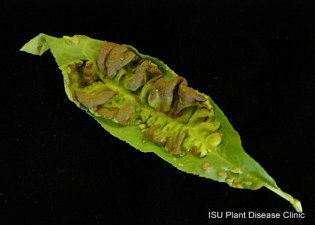 Peach leaf curl is a fungus disease that, under the right conditions, can cause severe early defoliation and crop loss on nearly all peach and nectarine cultivars. As the name of the disease implies, the most common and striking symptom of leaf curl occurs on the foliage. Infected leaves are severely deformed and often display a variety of colors ranging from light green and yellow to shades of red and purple. Eventually the leaves turn brown, shrivel, and drop from the tree. Many infected fruits drop early and go unnoticed; those that remain may become crooked at the stem end like a small yellow squash, while others develop reddish to purple, wart-like deformities on the fruit surface. After infected leaves drop, peach trees will generally produce new leaves. In severe cases canker infections develop more easily and trees may fail to develop adequate winter hardiness. Severe leaf curl can ruin one season's crop, and may set the stage for more long-term problems related to stress. The pathogen infects peach buds in spring from bud swell to bud opening under wet conditions and air temperatures in the 50o to 70oF range. By the time symptoms are seen, the main treatment window has passed. If your trees have this disease the best time to treat the trees with well-timed fungicide applications in is the fall after 90% of the leaves have fallen, or early spring before bud break. However if the tree is left untreated after you notice peach curl the tree will weaken, so start treating the tree immediately you see any signs of infection. For the growing season when a leaf curl epidemic hits, remove all infected foliage even if it means taking off 90% of the leaves. Then spray with Bonide Liquid Copper Fungicide. It may burn the remaining leaves but it is essential to spray all parts of the tree, and it will help stop the leaf curl from spreading. Minimize stress on the infected trees by supplying some extra fertilizer, particularly nitrogen. Irrigate regularly, and remove the fruit load. This allows the tree to resume growth and replace the infected leaves more quickly. In the fall after the leaves have dropped, thoroughly spray the tree with Bonide Liquid Copper Fungicide. Spray once again in spring before the buds swell and before rain washes the overwintering spores into the bud. 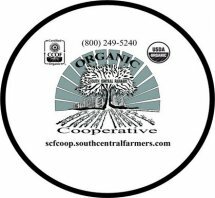 We are an established drop off point for the South Central Farmers Cooperative Community Supported Agriculture vegetable boxes. The boxes are delivered to Deep Roots Garden Center every Wednesday at approximately 2.00 pm and we store them in our large flower cooler until closing time the following day. Customers may order a box every week, every two weeks, once a month or simply when you feel like one. The boxes contain enough seasonal vegetables to feed a family of four for a week or a single/couple for two weeks. Payment is in advance – please place your order before noon on Mondays. Why not come in and order a box? Or you can phone 310-376-0567 or e-mail deeprootsnews@aol.com and order one. CSA have raised their prices starting April 13, 2011 but at the new price of $21 a box it is still great value. Look no further for all your Prom boutonnieres and corsages or Grad bouquets and arrangements! Our unique, custom, one-of-a-kind floral arrangements are created to your specifications by our talented team of designers. 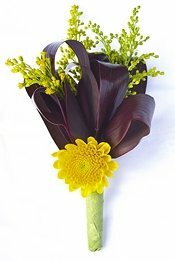 To see examples of our designs go to our website http://www.deep-roots.net/FlowerShop.htm and click on the link to the floral design galleries. Each photo links to an individually themed gallery of arrangements. New photos are being added just about every day. Hummingbirds are native to the Americas and are normally found only in tropical or subtropical regions. Interestingly, hummingbirds have little to no sense of smell, and are mostly attracted to plants because of their brightly colored flowers. Hummingbirds are fun to watch and they serve a great purpose in pollinating flowers in the garden. There are several things you can do to encourage hummingbirds to visit your California garden. Tie an orange ribbon round the old oak tree. Use foot-long pieces of surveyor's tape (bright red or orange plastic ribbon sold in hardware stores) to catch the eyes of passing hummingbirds. Tie these pieces to bushes, trees, deck railings—anyplace near flowers or feeders. The bright colors will lure migrant hummingbirds down from the sky for a closer look. When they get there, they'll find your flowering gardens and hummingbird feeders, which might make them decide to stay for more than just a rest stop. Hummingbirds not only drink nectar but they also eat a wide range of insects. Many flycatching birds like to use snags for perching and hummingbirds are no exception. Why do they perch? To rest, to preen, but most of all, to hunt. After beating your wings at a rate of 80 beats per second, you'd feel like taking a break, too. 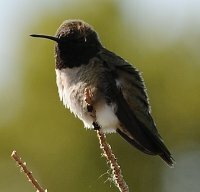 All hummingbirds, but especially males, like to perch on the end of an exposed branch. From this vantage point they can see danger or rivals approaching. And they can sally forth into the air to grab a tasty insect, should one happen to fly past. If you want to hang a hummingbird feeder in a tree most experts consider plain white table sugar to be the best nectar substitute for the birds, and discourage using honey or other sweeteners in hummingbird solutions. Don't remove those spider webs. Hummingbirds use spider web as a main ingredient in their nests. Strands of spider web hold the nest together and to the branch upon which it is built. Hummingbirds also love to steal insects from spider webs. Insects are an important source of protein for hummingbirds, and they'll get them any way they can. How convenient for hummingbirds to have spider webs do the catching for them. 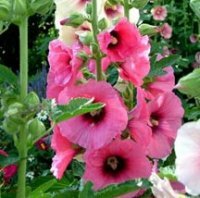 Plant flowers that attract hummingbirds. Hummingbirds can eat up to 8 times its body weight in one day so they need lots of food sources. Hummingbirds tend to gravitate toward red colored flowers but will feed from any flowers with nectar of a high sugar content. Include flowers of varying color and shape in your garden to keep hummingbirds interested as hummingbirds prefer a mixed diet of nectar sources. The variety of plants for attracting hummingbirds is so great that, in the process of building hummingbird gardens, you could also be building a landscape that will be the talk of the neighborhood. In selecting flowers to attract hummingbirds, you are not limited to using red flowers, although the color, red is notorious for attracting hummingbirds. In any list of flowers commonly used for attracting hummingbirds, you'll see lots of red flowers, but also flowers in purple, white, orange, pink and blue. They're all rich in nectar. 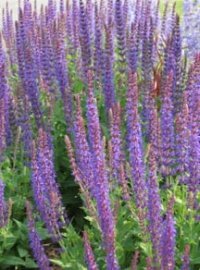 Plant large clumps or drifts of flowers as you might see in nature, but keep them spaced far enough apart so the hummingbirds can maneuver among the stems and plants. Hanging baskets are excellent as they provide color and flowers through the season. Being near homes they also afford closer viewing of hummingbirds. Good choices for these might be fuchsia, trailing petunias, or nasturtium. Fountains and birdbaths attract hummingbirds. In addition to food, hummingbirds need water. Most of what they drink may come from flower nectar, but bathing at least daily is crucial to keep their rapidly moving wings cleaned. You can help provide water by having a birdbath or any rough-surfaced and shallow container. Hummingbirds also like waterfalls as in a water feature, or even just water on leaves, which they fly through for a quick shower. The diversity of plants for attracting hummingbirds is not restricted to color. 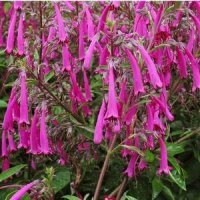 Annuals and perennials, vines, shrubs, trees, bedding plants and hanging plants: you can choose from all these categories in selecting flowers for attracting hummingbirds. These are just a few of the plants that attract hummingbirds.